Isn't it true that you are always aware of your security? It doesn't matter it's your life or your data. Security matters everywhere. So when it comes to social profiles like Facebook, you are much considerate about your information you have fetched into your profile. Would you like if someone hacks your Facebook account and reveal your personal information to the public? I don't think so, unless you have important and sensitive personal information on your profile. My advice to you is, please don't publish sensitive and most private information online unless you wanna risk them. Anyway, though still you don't have any private information published in your profile, you don't wanna see that anyone else hacks into your profile. Do you? Usually how do we get to know if someone got our login credentials? Well, we don't know until he/she logs in to our account and be stupid enough to spoil our existing information or do something visible to us. It doesn't matter if someone got your login credentials 'cause you have provided your login information deliberately to another, right? But it depends on trust. Anyway what if someone login to your account, but doesn't do anything stupid to suspect that someone has your login credentials? Things can get worse in that way, 'cause you feel safe using Facebook, but you aren't. 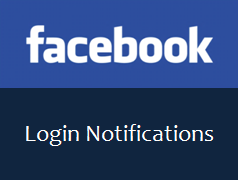 For this matter, Facebook has a way to alert you whenever someone logs in to your Facebook account - Login Notifications. With Facebook Login Notifications enabled, you will receive a notification email or text message whenever an unauthorized login has been tracked by Facebook. The process is quite simple to understand. Facebook saves your devices as trusted devices such as your personal computer, mobile device and whenever a new device other than trusted ones pops in and login to your Facebook account, you will be notified rightaway. You have to understand that if you login to your Facebook account for an urgent matter through a friend's mobile device, Facebook will notify it as an unauthorized login though you are the one responsible or that log in. The reason is it's not the regular device you use to login to your account and Facebook keeps track of devices you used to login not you personally. Well, it's obvious, right? Just for the record. 2. Navigate to Account Settings. 3. Click on Security tab on left pane. 4. Now click on Login Notifications setting. 5. You will prompt to select the way you need to receive login notifications - via email, text message or both. Note: To receive login notification as a text message, you need to have your mobile number added to your Facebook account. 6. Click Save Changes button after selecting your preferred notification options. Note: You may encounter an error when saving if you use private browsing, clear cookies or have set up your browser to clear browsing data when exit each time. If so, disable such options or use regular browsing mode to activate log in notifications. If it prompts same message over and over, you may need to wait few days, log out and log in to your account again to enable login notifications. * After enabling login notifications, you will have to name your computer or device you use to log in to Facebook in next login. The device will save under Recognized Devices which you won't get any notifications when you login to Facebook through same computer or device next time, unless you clear browser information or use features such as private browsing. Note: Name your device only it's a trusted device or if you regularly login to Facebook via that device only. Else if you login through shared or public computer, click Cancel when it ask to name your device. Luckily, I don't have any private information on FB (I think, but were do we draw the line between private and public information? Is revealing our address a bad thing? What about our cell phone number?). I have already activated this for my FB account, so I get notifications in my inbox, every time I login from somewhere else (I travel a lot, especially during summer). You see, you are careful about information you post online so you don't need to worry. Same here. You're correct mate. It depends always. But I was aware of posting contact information unless it's really matters. Still simple plain email works here :) Incognito mode works well. I'm not really a fan of notification emails, so activated mobile alerts which is favorite of mine :) I'm safe so far but this one helped my friends as they were hacked lately. I know no one needs to hack my account :D LOL... But we still value privacy, right? So stay safe mate :) Glad you already had it enabled for your account. Yeah I know, we better be on safe side as we deal online, right? :) Also there are tricks to log in to Facebook accounts. Fortunately, if they work fr 'em, we can get to know and take actions against them too. Sounds like a great idea! Is there a way to turn it off so that you can login from a different computer and not be recorded as a hack? If you log in using another computer or device, it will recorded as safe if you name it there. Then you won't get any notification when you use that device to log in again. First time, you will get a notification. I learned this some time ago Mayura so I know that by you sharing this with others you'll definitely help them understand how they can set their account to notify them of any strange activity going on. Great job with this post, as always. You're so helpful. Mayura: This is a great reminder to be vigilant about what information we publish and to double check our security settings. So many times, we rush through all the "to-do" tasks online and forget to pay attention to small yet vital aspects. Thanks for sharing!